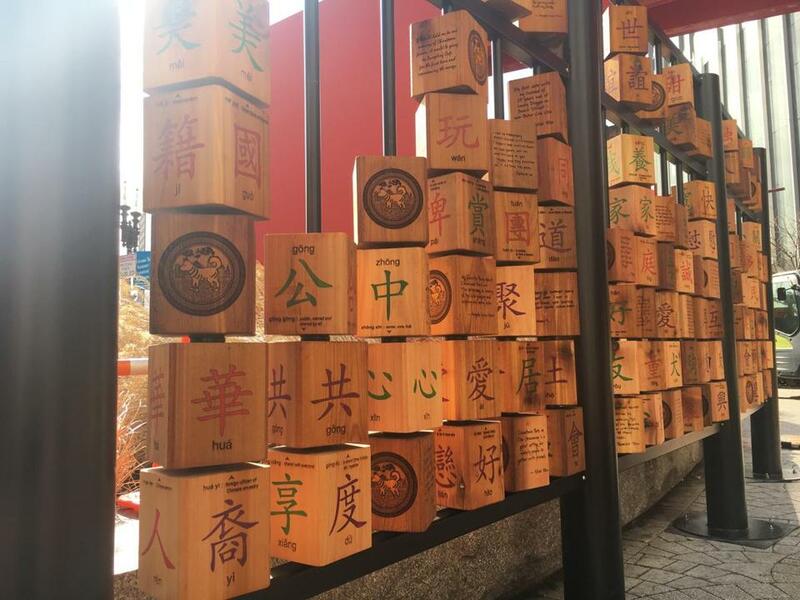 Risa Puno’s installation is made up of spinnable wooden blocks engraved with traditional Chinese characters and texts from stories gathered from the Chinatown community. Celebrating the Year of the Dog, the Rose Kennedy Greenway Conservancy has installed a new piece of public art in Chinatown Park. It’s titled, appropriately enough, “Year of the Dog.” Risa Puno’s installation is made up of spinnable wooden blocks engraved with traditional Chinese characters and texts from stories gathered from the Chinatown community. Puno collected the stories with the assistance of Asian Voices of Organized Youth for Community, the youth-leadership program of the Asian Community Development Corp.
“Year of the Dog,” which sits in front of the park’s Essex Street gate, is the fourth in an annual series of public artworks from the conservancy inspired by the 12 years of the Chinese Zodiac.